Welcome to House Rules! After months of hard work we had our grand opening on Saturday May 13th, and we’re so excited to finally be welcoming the community into our space. 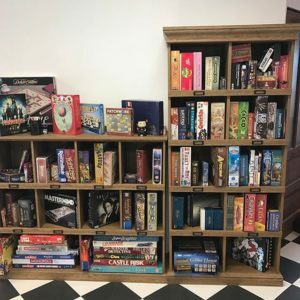 Over the past year, many folks have asked us “what the heck is a board game cafe?” We believe that at its heart, it’s a place for the community to come together, eat delicious food, and play a game or two from our adventurously curated library. Although this may be your first time hearing the term, board game cafes have been popular throughout Asia since the 90s and have been growing in popularity in North America for the past five years or so. After the founding of Toronto’s Snakes & Lattes in 2010, board game cafes started to pop up in major cities across the U.S. 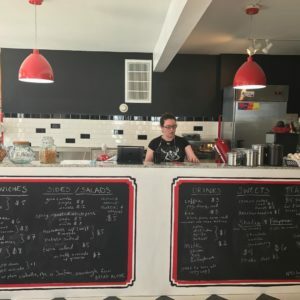 Lately there’s been a visible increase in public interest in tabletop and board games, and this has driven the rise of free-standing cafes dedicated wholly to providing a space for the community to play games. At House Rules, we have created an inclusive, welcoming community where there’s something to interest everyone. Our library has all the classics as well as some exciting modern games you may have never played before, and to help you get a handle on our collection we’ll be featuring a different game in each of our bi-monthly newsletters. 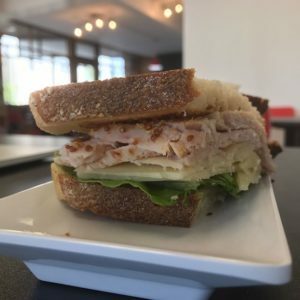 We have a varied menu with sandwiches, homemade baked goods, coffee, frappes, and all sorts of other great stuff. We also offer bagels in the morning and take-out all day, and in the coming months we’ll be serving beer and wine as well. At House Rules you can sit, play, and eat for as long as you like. There’s a per-person fee of $5 for access to the games collection, which is included in your bill, and we also offer weekly and monthly memberships for those who just can’t get enough of our games. So we hope that everyone stops in, grabs a table, orders some great food, and plays some fun games! Previous Previous post: Welcome to House Rules Cafe!